Dhoklas for breakfast, breakfast dhokla recipes. We present you a stunning variety of dhokla recipes for breakfast. Dhokla, the ever-popular Gujarati snack is quite appropriate for Breakfast too as it is healthy, tasty and Steamed. There are also so many varieties to try out that you will never get bored of this category. Use Yellow Moong Dal in making dhoklas. Yellow Moong Dal : The fibre (4.1 g in ¼ cup) present in yellow moong dal prevents the deposition of bad cholesterol (LDL) in the arteries which promotes a healthy heart in turn. Packed with nutrients like zinc (1.4 mg), protein (12.2 mg) and iron (1.95 mg), yellow moong dal helps to maintain the elasticity of your skin and help to keep it moist. Fiber, potassium and magnesium from yellow moong dal will work together to regulate blood pressure and soothe the nerves and is diabetic friendly. See here for details of 7 amazing benefits of yellow moong dal. So make the healthy moong dal dhokla to start your breakfast on a healthy note. Anything with rava seems to taste good. The Rava Dhokla is quick and easy to make, without requiring any grinding or fermenting, yet it is as fluffy and tasty as you would expect a dhokla to be, making it an ideal dish to whip up for breakfast or evening tea-time. Another option is rava and vegetable dhokla which has mixed vegetables added to it and this gives more fibre to the dhokla making it a lot healthier. Made at every Gujarati household, khatta dhokla is also readily available at numerous retail outlets. Lots of small retail outlets carry daily fresh stock of khatta dhokla. So you have the option to cook or buy it readymade in the stores. Also, this dhokla is preferred by guests from out of India as by nature its a bit sour in taste and goes well with a healthy green chutney. Try out interesting options like the Methi Palak Dhoklas , Sprouts dhokla, Poha Dhokla and lose yourself in the lip-smacking, melt-in-the-mouth experience! 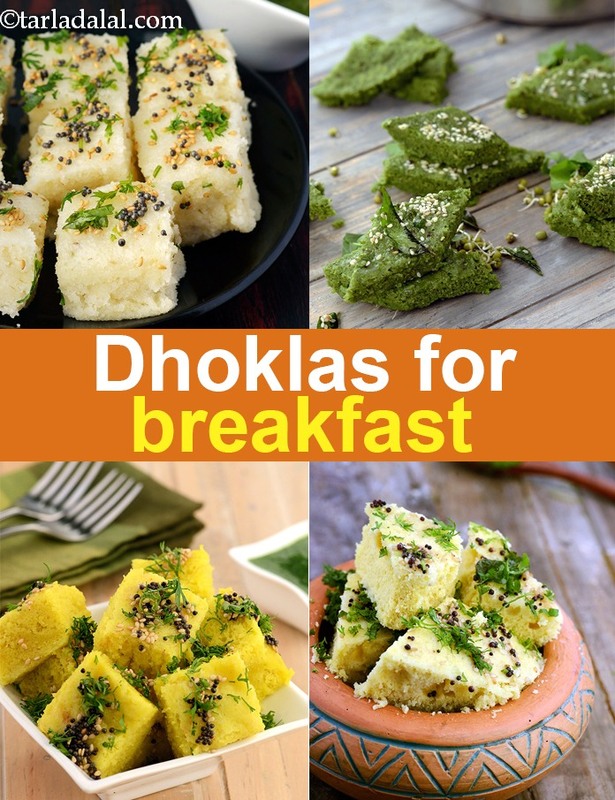 Enjoy our Dhoklas for breakfast, breakfast dhokla recipes and other breakfast articles below.